Get stage-ready power and bass tone in a super-portable head. Although it weighs only 5.7 lbs and is 7.5” wide the BP-800 is built with the ruggedness and precision needed to withstand all the rigors of live performance and the road. 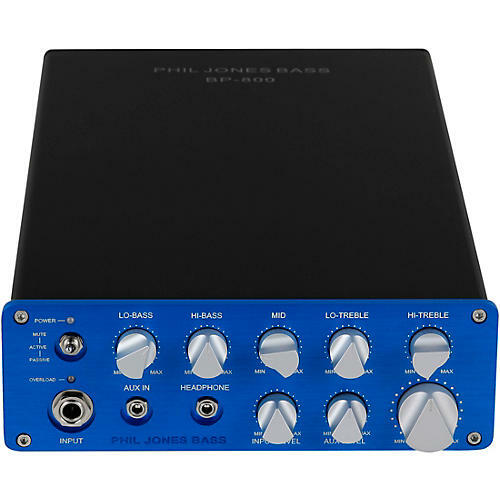 The appealing blue front panel is a quarter inch thick and CNC machined, while the chassis is built from thick aluminum extrusion making it incredibly strong. All control knobs are PJB design solid aluminum billet for a high end look and feel. The BP-800 will work on any AC voltage from 100- 240 volts AC, enabling it to conveniently travel worldwide without having to switch to local AC supply voltages. The power output is 450 watts into 8 Ohms, and 800 watts into 4 ohms (maximum load). The dimensions are 7.5” wide x 2.5” high x 12.5" deep. Dimensions: 7.5" x 12.5" x 2.5"